Workshops are an investment. Participants set aside time, money, work schedules and family duties to attend. New ideas and techniques are explored. Skills are honed, materials explored, friends are made and creative energy fills the air. 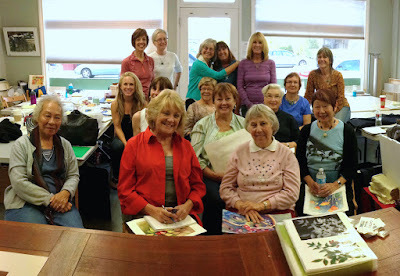 Workshops should be a wonderful and enriching experience for everyone who attends. I’ve been teaching classes and workshops over 18 years and I've learned a lot along the way. Let me share my thoughts and experience with you. Be honest with yourself about your skill level. You’ll avoid disappointments. It’s not possible for a teacher to bridge a lack of skill and inexperience in the short time we have together. 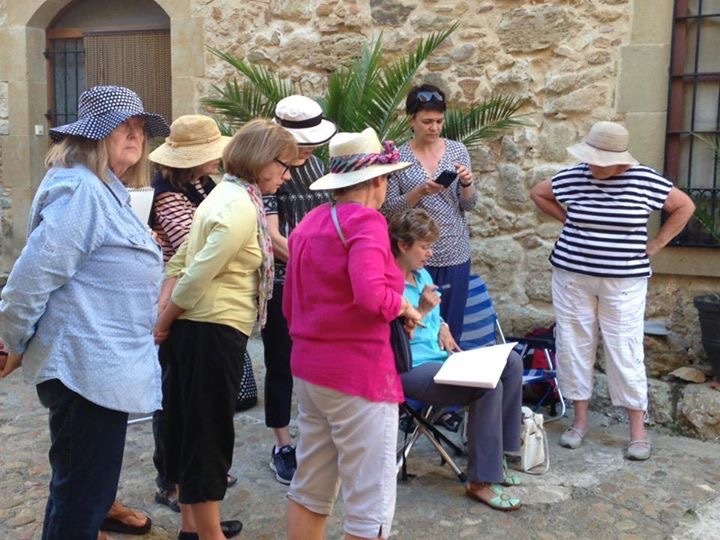 Skill will be achieved by the amount of time you spend outside the workshop sketching and painting. I do my best to give everyone equal time. Don’t expect a teacher to be your private instructor in a workshop. Please don’t ask workshop participants to help you. They came to be immersed in the workshop experience, not to be a teacher. If you’re struggling speak to me privately. If you are very sensitive to noise or others talking, bring ear phones to block out noise or listen to your music. Arrive on time and be mentally prepared. Please turn off your cell phone in the classroom. If you must talk on the phone (family emergency…) take it outside. This includes lunch time. Set up your watercolor palette with paint before the workshop. Bring what you need…but not your entire studio. Ask before taking pictures, videos or audio. Each teacher has a different set of guidelines about their artwork and examples being shared on social media. Give the teacher time in the morning to prepare for the day. I come in early in to set up for the day. I'm often asked, “Can I have just a minute?” I'm happy to answer those questions during the day but the morning is devoted to preparing for the day. Please give me 20-30 minutes to set up and I will give you an entire day of undivided attention and instruction. I enjoy eating lunch and socializing with workshop participants. It's fun to learn about you, hear your stories, experience, thoughts... Lunch time isn't a good time to ask me to review your portfolios, sketchbooks or view paintings on your phone. It's time to eat and recharge. In closing I’d like to say, Workshops should be a magical experience. Come prepared and with realistic expectations of me. I'll do my best to guide, encourage and instill my knowledge. Thank you so much for sharing this perspective Brenda. You hit each "nail on the head" perfectly. This is great enlightening advice for attendees of any creative workshops. We love our students to pieces and we strive to provide a memorable and cherished experience. As a fellow instructor, I applaud and appreciate your putting this into a clear thought. See you next year! I agree with this totally. I’ve taken classes where there’s too much talking and it’s distracting to the other students and the instructor. I've begun instructing classes and workshops myself, and I can relate to these guidelines for making the experience most beneficial for all involved. Especially about giving the teacher setup time and recharge time at lunch. I've already had the experience of showing up early to set up and early-arriving students seeking my attention. It's natural and I can understand it, but I want to be properly prepared mentally and logistically. How to handle it gracefully...that's an art unto itself. And yes, as an introvert, it takes a lot of energy for me to teach (being new at teaching is also a factor) and the recharge time at lunch is so helpful. Exactly!! How to say I need alone time to prepare or recharge is a tricky situation. Glad you and I are are the same page...I'm not alone! Brenda, you are a wonderful workshop presenter, and definitely deliver everything you promise! What a joy to work with you this summer at Cheap Joe's in Boone, NC. Thank you! Brenda gives everyone a great workshop experience, I attended a workshop of hers in Boone a couple of years ago and was inspired by her. Thanks for the suggestions Brenda on giving an instructor space and time to recharge, I will keep this in mind for future workshops. Thank you for your kind and understanding words! Thanks for this perspective, Brenda. 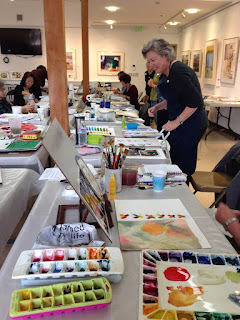 I have recently started instructing watercolor classes for beginners and I find the un-said expectation that somehow I as the instructor will bridge the skill or lack thereof in the class magically is stressful! You said it beautifully that practice and diligence outside the class will turn the page on this one! And it's true! Thats how I have progressed in my practice! Thanks for sharing! Bless your heart 💕Thank you! Thank you for your sweet words. Thankfully most participants understand. It's the few and far between that need the reminder. Brenda such wonderful tips that I hope I remember when I take a future workshop. Have a super day. I would add that some instructors travel through various time zones- be aware of their possible exhaustion at the end of the day. Yes! That’s a good point. Your guidelines come from lots of experience! Do you share these perspectives with your students before each workshop gets going? Your comments sound as though you've had some bad experiences. I think though the way it's worded sounds quite angry and if you sent that as a pre workshop link it might be off putting. I have never found your writing in your blog to be this way so I was surprised. Laura . Not every topic is one I enjoy writing...this is one. But it needed to be said all the same. I labored over the wording a long time not wanting to offend but voice realistic expectations of me and workshop participants. It's unfortunate you felt it was angry... That was not how it was written. Not angry....just matter of fact, which unfortunately is sometimes needed for those whom "getting the hint" doesn't come easy. Then the class becomes more pleasant for all--instructor and other classmates alike. I've often taught or taken classes that were monopolized by people whose neediness threatened to overwhelm the experience for everyone. If the situation doesn't get nipped in the bud or prevented beforehand with a hand-out like yours, it can become difficult to recover the class. Doesn't happen often, but enough so that preventive care is needed, just in case. Thanks for this! I appreciate your input. You words show experience and wisdom on a topic that is hard to address without being thought of as angry or controlling... I am simply trying to set the grounds rules for a pleasant and rewarding experience for all who participate. This is very well said, as someone who has been involved in hosting or attending multiple workshops, I think you set some very good and reasonable guidelines. A possible addition: Your instructor and / or classmates may be somewhat chemically sensitive. Please refrain from wearing strong perfumes or colognes that could trigger allergies or asthma and negatively impact the environment for others. Yes, Brenda, teacher's time is very valuable! Thank you for writing this. I was wondering if you are planning any abroad workshops for the next year? Thank you.